Wireless systems are not just desirable, sometimes they are bloody essential. Large stages, outdoor areas and moving between rooms can often mean our old friend the cable is just simply not going to cut it. Fortunately we have wireless equipment to fall back on and enjoy the true freedom that only a cable-less system can provide. However wireless is not without its faults and has its own set of unique challenges. Here we look at what those challenges are and most importantly how to fix them. Interference - the classic wireless problem, Just ask Nigel Tufnell. In built up areas interference can come from TV stations, radio stations and many other RF sources. The best way to avoid this is to, if possible, change the frequency that you are using by at least 0.25MHz (250kHz) either up or down from where you are experiencing the interference. However in some areas this can run over multiple channels. A system with an automatic frequency detector is very useful in these situations. Intermodulation - This is a very common problem with multiple channels, or microphones operating in areas of severe RF overcapacity. It basically means that two or more signals of the same strength are interfering with each other and the receiver cannot demodulate more than one signal on one frequency. In other words it is not possible to mix signals from multiple transmitters, as the receiver will always capture the stronger transmitter. Managing your wireless systems when using multiple transmitters is key to delivering a problem free event. A simple way of doing this is by using the same wireless systems but operating in different bands, this can increase this number substantially. For example rather than using 10 single receiver systems all operating in the 650-680 MHz field use 5 that operate in the 650-680MHz field and 5 that operate in the 570-600MHz field. Obviously this will be dependent on geographical location but a system available in multiple bands should be able to handle it. Transmitter problems - The Antennas play a hugely important role in the wireless system setup. Nearly all body pack transmitters have an antenna sticking out of them and it is vital that this remains free from bending or any other form of stress. Another tip for body packs is to make sure that the antenna is not touching the skin as the human body can act as an antenna and absorb the signal. As for handhelds, modern transmitters will use a dipole transmitter. This means the transmitters has two antennas built in so no matter how you hold the microphone one of the antennas should be free to send signal. Receiver problems - at the other end of the system receivers can have their own set of issues to contend with. Make sure that your standard ¼ wave antennas on a receiver are positioned at a 45 degree angle. If you are using an external omni or uni directional antenna these need to be placed at least 1.5 meters apart. However even this is not always ideal to get a true diversity coverage. If possible place them 3 meters apart. If you are using multiple receivers, then don't make the very common mistake of using the all supplied antennas on all the receivers. This alone can be a source of intermodulation. Much better to employ an antenna splitter such as the wideband AKG APS4, which as you may have surmised, will split a pair of A/B antennas to 4 separate receivers. Plus, if you are using a receiver such as an AKG WMS470, the APS4 will also supply power to the receiver down the same antenna cables and save a multitude of plugpack PSU's in your rack. If you have more than 4 receivers, the APS4 also has a cascade output to connect a further APS4. So with the problems identified and solutions found what equipment satisfies all these requirements? 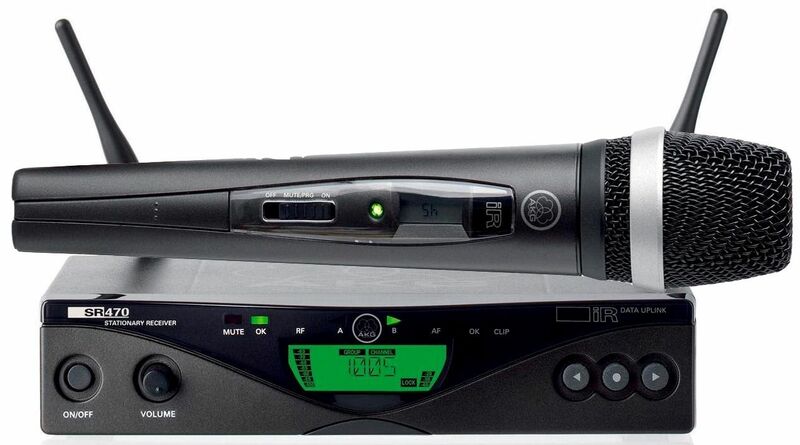 The AKG WMS470 series features all the solutions to the most common wireless problems. Each receiver in the WMS470 range features and automatic frequency setup to find the cleanest channel in your area. However you can still manually adjust the channel being used if required. It is also available in 3 different bands 570-600 MHz, 600-630MHz and 650Mhz -680MHz meaning there is potential to run up to 48 channels at once. Each handheld transmitter features a dipole antenna and the receivers are compatible with external antennas, and antenna splitters. In addition to this each transmitter can be charged using the optional CU400 charging station and are compatible with standard NiMH rechargeable batteries.